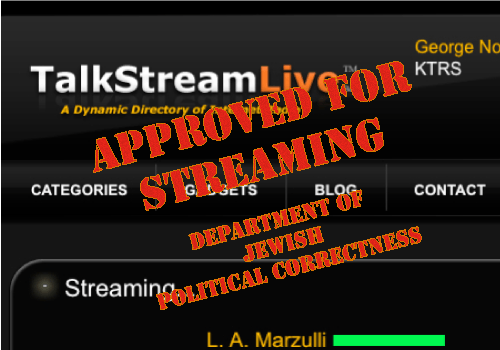 Under Threats from Jewish Groups, TalkStreamLive Drops Inside the Eye – Live! 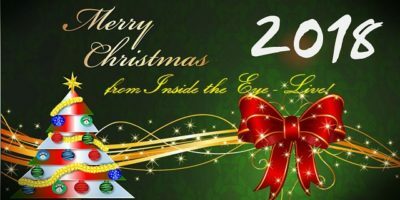 from Saturday Line-up | Inside the Eye - Live! 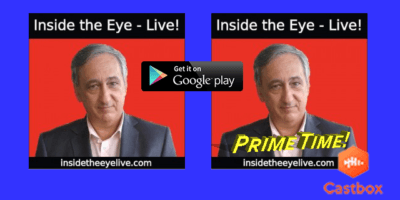 Under threats from Jewish media censors monitoring TalkStreamLive, TalkStreamLive has removed without any notification the popular political talk show, Inside the Eye – Live! 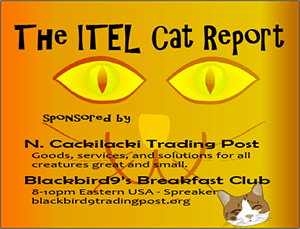 with The Fetch, from TalkStreamLive’s Saturday aggregation line-up. Sources note that Jewish groups have been active in monitoring online media sites in an effort to put a total blanket on the information flowing out to the American people and larger global community and that Inside the Eye – Live! was specifically targeted for deletion from TalkStreamLive’s aggregation Saturday morning line-up. Indeed, there has been a disturbing trend in the alternative streaming news segment. When seen in the light of defacto operating unaccountable Jewish censors, Americans and the world at large are seeing their choices of media programming increasing censored, including completely disappeared from the World Wide Web, in an effort by Jews to preclude any mention of Jewish involvement in the theft of trillions of dollars from the United States economy, Jewish involvement in the poisoning of the food supply, Jewish involvement in the phony “War on Terror”, Jewish involvement in the attack on the United States known as “9-11”, and Jewish media manipulations, to name but a few. All of the above realities, plus the Jewish involvement in the attempted frame-up of the Syrian government in the use of chemical weapons in the early part of May, 2013, hint at an agenda by global Jewish interests to bring the citizenry of Western civilization powers into another war in the Middle East for the benefit of Jewish geopolitical interests. And it is precisely this effort to keep reality “under the blanket” and out of sight and earshot that has de-facto Jewish censors working tireless to bully and threaten website owners and aggregators. Traditional American and Western values of free speech are being ground down in favor of an Orwellian Jewish Bolshevik construction. The idea of “imposed constructions on language” are not so difficult to comprehend: the manner in which constructions are imposed is through a focused effort to control definitions and word usage. In this area, owing largely to Jewish control of media cultural (film) assets and intelligentsia (higher education), the task of controlling definitions and accepted “word usage” has proven to be markedly easy and effective. 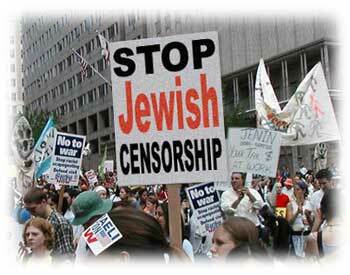 When we factor in the absolute disdain Jews have towards non Jews as regards “free speech”, and in light of active and overt effort by Jews to impose partial to absolute censorship, we must factor in that success in destroying the free flow of ideas is magnified through what appears to be in many places a Jewish control of the legal system. Threats of legal action are enough to bring down even the most staunch supporter of Western values regarding free speech, and Jews use this threat to an almost exclusive degree. However, the idea of Jews “suing people” to impose public censorship is such an intellectual affront that a healthy court system would laugh Jews who tried such a legal assault straight out of court, with a kick in the behind in the form of massive fines as penalties for the wasting of peoples, and the courts, time. But such is not the case: corruption and rot of Western values seems nearly complete. Nowhere is this more evident than when a PRIVATE UNKNOWN JEWISH ENTITY can IMPOSE LITERAL CENSORSHIP through targeting large cume alternative media outlets. It is as if cowards, hiding in the shadows, unable to effect their agenda, use lies and the threat of legal force to impose their agenda. It is a form soft but very real form of TOTALITARIANISM practiced by Jews. No self respecting Western civilized person would dare to accept the verbal and intellectual assault of some PRIVATE person, Jewish or otherwise, telling the collective what we can and can’t say, what we can and can’t hear, and whom we can and can’t freely associate, for it is through our words that we communicate: we speak, we listen, and we associate based on the actions and ideals that travel and coalesce within communication structures. 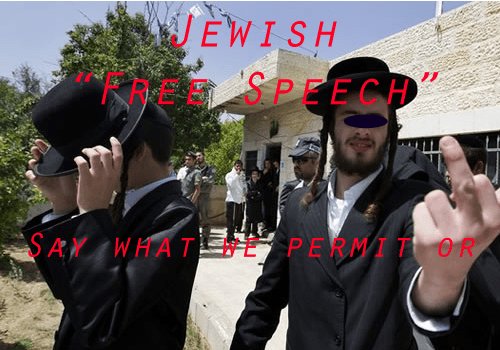 ALLOWING PRIVATE JEWISH INDIVIDUALS OR ENTITIES to IMPOSE CENSORSHIP is a DIRECT ASSAULT on not just “free speech”, but the very Western right to freely associate. Take away the communication, and the right to associate rapidly follows. 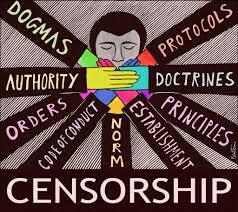 In this light we can further understand the disturbing trends towards self censorship of those afraid of Jewish tyranny, those who support Jewish tyranny, the very real imposed censorship by Jewish individuals and entities on our collective rights as they seek to bring about tyranny. A case in point is the rather sudden declaration by Orion Talk Radio, a moderate sized streaming political talk radio station, who was forced to “clean up their act” and publicly embarrassed themselves with a treatise that could only be seen as written by Jewish censors seeking to justify their right to censor our collective ability to speak, hear – and thus associate. Here we see a loaded sentence filled with Jewish language constructions. First and foremost, “who” gets to determine what is and is not a “reckless” use of the language? Are we to presume that only Jews know how to use the language and that intelligent mature adults across the political spectrum who are raising awareness of Jewish mismanagement in all phases of their political, economic, and social activities are somehow not quite clear and intent on what they are saying? Further. Who is defining “reckless”? How is it being used? Is it being used in a manner that is purely understood from a Jewish group think strategy, an academic framed absurdity, or…? “Reckless”, in this case, is cleary an open ended language construction that has been charged to Jewish social and literary constructions. It means absolutely nothing to a non -Jew unless a non – Jew wishes to make it mean something. In reality, such open ended language constructions are forms of intellectual violence intended to insult and assault the intelligent and unsuspecting alike. To the intelligent, we see the absurdity and intended insult and assault on our intelligence. To the unsuspecting, the real target of Jewish language constructions, the attempt is to create a political mass willing to bend to Jewish political agendas and through “democracy”, enforce graduated levels of Jewish constructed tyranny. Further, as regards the phrase, “trying to hide behind freedom of speech”: how can anyone INTELLIGENTLY claim that someone is “trying to hide behind free speech”? The truth of the matter here is that this ghost scribbler for Orion Talk Radio was projecting onto their target. It is the “ghost scribbler” here who was and remains seeking to “hide behind free speech”, for the real intent of the ghost scribbler is to deny others their right to speak freely. In truth, “Free speech” is simply the palette upon which all communication is caste. It is a utility used for communication. Thus, to those of us who are prodigy of the progenitors of Western Civilization and the ideal of freedom of speech and the resultant freedom of association and assembly, the idea that somehow we need to “hide” behind “freedom of speech” is an intellectual absurdity. 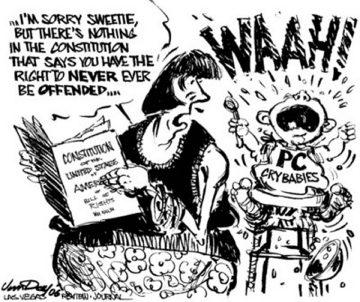 Freedom of speech is the palette upon which we create the free flow of ideas, and so long as that palette is open to all, then what is right and good will always prevail for the arguments and logic of Reason will always resonate more strongly in the hearts and minds of humanity that the arguments and logic of the Tyrant. Thus we have nothing to fear and certainly no need to “hide behind freedom of speech”. So long as we enable and allow ABSOLUTE FREEDOM OF SPEECH relative to the free flow of ideals, we have nothing to fear. Falsities will sink and drown while the truth will rise and float as an iceberg upon the seas. The use of crafted impositions on the language with the intent to destroy “freedom of speech” is being done precisely to deny enough ice from forming such that the collective truths raise themselves above the Seas.